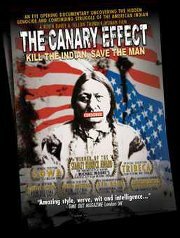 This Saturday, the Bloom Collective will host a screening of the documentary, The Canary Effect: Kill the Indian, Save the Man. From multi-award winning directors Robin Davey and Yellow Thunder Woman, comes this ‘Illuminating Documentary.’ Delving deeply into the often misunderstood and frequently over looked historic realities of the American Indian, The Canary Effect follows the terrifying and horrific abuses instilled upon the Indigenous people of North America, and details the genocidal practices of the US government and its continuing affects on present day Indian country. including controversial author Ward Churchill, the film brings together the past and present in a way never before captured so eloquently and boldly on film. According to the Facebook event page, the Bloom Collective says: Join us for a viewing and discussion of the film as we prepare to venture into the Thanksgiving season. Following the film there will be a discussion, donations accepted.